On April 6, 2019, Chancellor Robert J. Jones, alumni, and friends gathered at the Computer History Museum in Mountain View, California, for an evening reception and panel discussion that showcased Illinois' impact on the world. ECE ILLINOIS alumni Sanjay Srivastava (MS '87) and Gregg Zehr (BSEE '76, MSEE '77) were among those in the panel. Srivastava currently serves as the chairman and CEO of Vocareum which offers the leading cloud-based learning and assessment labs for a broad range of technical courses in CS, data science, machine learning, IoT, cloud computing, and cybersecurity. Zehr currently serves as the president of Amazon Lab126, a research and development team that designs and engineers high-profile consumer electronic devices such as the Amazon Fire tablets, Kindle e-readers, Amazon Echo, and more. 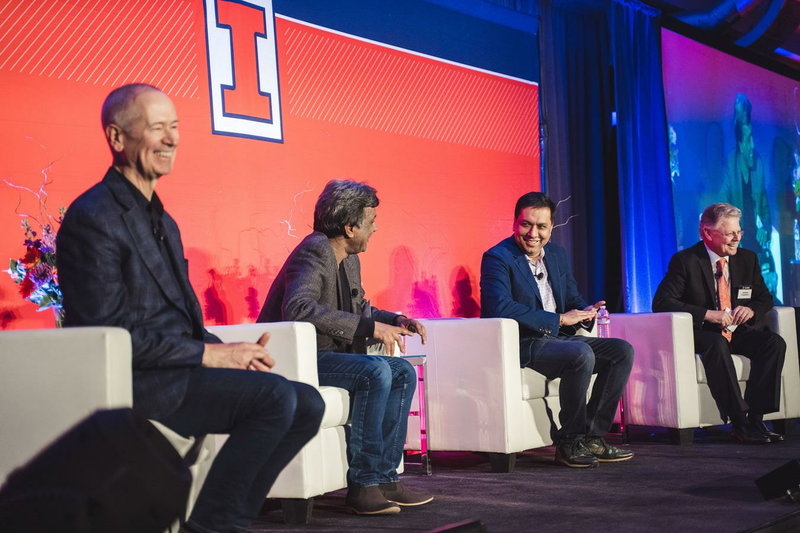 Srivastava and Zehr both reflected on fond memories at Illinois and pointed out changes that they have seen during their time in Silicon Valley. Srivastava also discussed the rise of IoT, machine learning, AI, cloud computing, big data, and what potential the fourth industrial revolution holds for the future of technology. Additionally, Srivastava and Zehr spoke on topics including developments at the University of Illinois, workforce diversity, product innovation, and more. To view pictures from the reception and watch the panel discussion, check out the With Illinois website.